John Farley did his engineering training as a student apprentice at the Royal Aircraft Establishment Farnborough before joining the RAF for pilot training in 1955. After flying Hunters with 4 Squadron based in Germany, he was a flying instructor at the RAF College Cranwell before joining the Empire Test Pilots' School course in 1963. Following a distinguished pass from ETPS he became a test pilot on the RAE Aerodynamics Research Flight at Bedford. During this tour he flew all the UK research aircraft then flying. As RAE project pilot on the P1127 prototype in 1964, he started what was to become 19 years of Harrier programme test flying moving from the RAE to join Hawker Siddeley Aviation at Dunsfold from where he retired as Chief Test Pilot. As the Harrier programme progressed, he became increasingly involved in overseas ventures especially with the US and various navies. John Farley has flown over 80 different aircraft types, both fixed and rotary wing. In 1990 he became the first western test pilot invited by the Russians to fly the Mig-29 and later participated with Lockheed as a JSF Red Team member. He retired from test piloting in 1999 but continues to consult on flight test programmes. In 1995 he started summer school courses for 16 to 18 year old students to encourage them to become engineers in the aerospace business and ran the Schools Aerospace Challenge and International Aerospace Summer School, both held at Cranfield University. John was one of the Founding Fathers of the Association of Aerospace Universities (AAU) and played a key role in successfully growing it through its infancy. He was appointed the second President of the (AAU) in April 2009 and provided invaluable guidance to members and executives until he stepped down in April 2015. As the Immediate Past President, he continued to be most helpful as and when needed, and all were most thankful to him for his outstanding leadership. John was undoubtedly the best V/STOL jet display pilot and seemed to defy the laws of physics at times. The skill he displayed when demonstrating the sheer vertical ascent manoeuvre from the ground (the signature 'rocket climb') in a Harrier followed by an airborne bow to the spectators is unique to this day for a fixed wing aircraft. Perhaps the most spectacular "slow flypast" ever displayed was that of a close formation of helicopters led by John flying his Harrier backwards! Despite his world-renowned achievements as one of the finest test pilots ever, he was extremely humble and a great inspiration to the youngsters, especially university students. 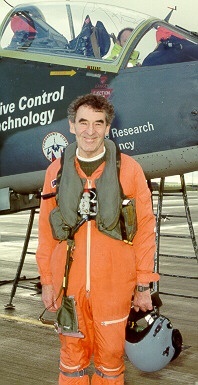 The photograph shows John standing beside the Vectored-thrust Aircraft Advanced Control (VAAC) Harrier and has been reproduced by kind permission of his family. The Association of Aerospace Universities is not responsible for the content of external internet sites. Unless otherwise stated, this website and all content © copyright The Association of Aerospace Universities.